A piece of early writing 'critiqued' ... note the question marks. I’ve been haunted today by the ghosts of papers past as I return to the beginning of my thesis to start the inevitable tortuous re-write. I am finding it hard to settle down to it. 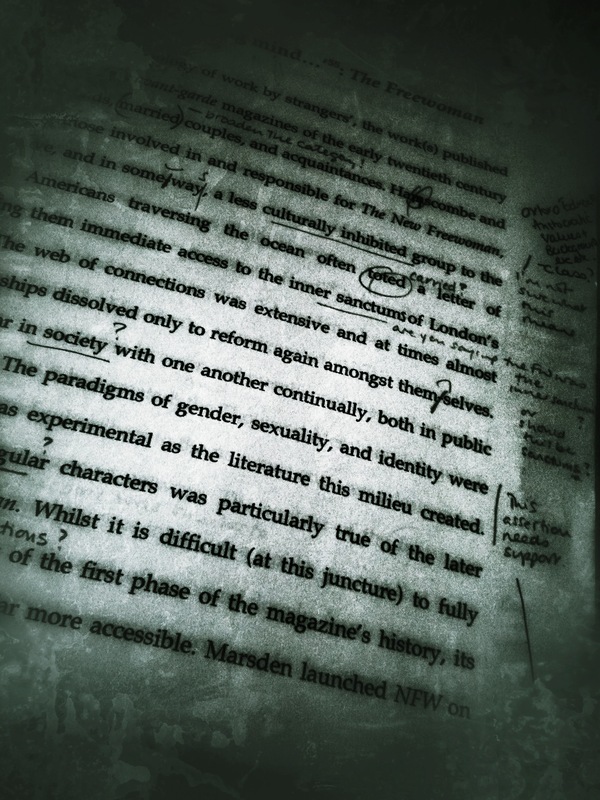 But one inevitability of researching is exorcising the ghosts of papers past editing your own work. It is probably the most difficult of the entire writing process. I don’t know about you out there, (but I imagine you are not much different to me in this respect), but when I hand over a piece of writing to be reviewed I am damn glad to get shot of it. Usually I am heartily sick of reading it and need to just get it out of my sight. So you can imagine how utterly sickened thrilled I am when it is returned to me, with orders from El Prima’s ‘suggestions’ for a complete rewrite improvements. I found the only way to edit one’s own work is to allow a certain amount of time to elapse before you so much as pick it up again. Preferably you will be able to write something new and fresh in the interim, returning to the original piece of work after several weeks has elapsed. By this time, hopefully, you will have given yourself enough time to become detached from the emotional trauma intensity of writing it in the first place. When I first started my research I spent an inordinate amount of time editing and re-editing the same exhausted and over written piece of claptrap few thousand words, in effect getting absolutely no where. I could rarely see what El Prima’s* suggestions meant and even more rarely could I seem to follow them through satisfactorily. Which led to a lot of swearing, screaming and tantrums frustration on my part and no doubt hers! My approach has changed dramatically. I now allow several weeks (perhaps months) to pass before I pick up a piece of work that needs serious revision. I am not talking about minor typos and grammatical errors, but pieces where large swathes need to be re-written in order to make the piece work. Usually by the time I return to it I have forgotten the majority of it (think Dory from finding Nemo, me research is basically a metaphorical ‘castle’ in goldfish bowl) and I can review it with fresh eyes and far less emotional attachment . I can also take the textual shredding criticism on the chin without feeling it is entirely personal and aimed at destroying me completely! This makes the process much easier on the psyche. Nevertheless I still feel the battle cry of “Once more unto the breach dear friends” on my lips whenever I know I am returning to the ghosts of papers past! *El Prima is my polite version nickname for my primary supervisor. My secondary supervisor is called El Secunda. I agree with your sentiments wholeheartedly. I know that the initial lag (procrastination) is because I hate the task of editing my own work, usually because i think, “did I really write something so silly?”. For me, it is kinda like when I hate to watch videos of myself “is my hair really like that?!”. But I definitely see the value in the Dory from finding Nemo moment and feeling like I am reading someone else’s work. Anyways, it was just affirmation that I need to allow this time of letting things sit, stew and marinate before re-editing instead of feeling like I SHOULD be working on it. In other words, I now give myself permission to let it sit (I have several projects in the works I have been feeling guilty about not tending to. That guilt has just been reconceptualized!)! See ya over in blipworld! Interesting post, I didn’t have enough time to leave my MA Dissertation for more than a couple of days in order to edit it. Now I am reluctant to read it in case I see too much I should have changed. Looking back at undergrad essays is bad enough! Time away from drafts is something I’ll bear in mind when (if) I start my PhD.